Are Pizza Cones A Good Idea? Home Made Pizza Cones! Got to leave and drive to work? But you’re pizza is ready now? Tough to carry a slice of pizza while doing things. Are pizza cones a solution? One of the problems with pizza cones is how to make them. You have to bake them upright while preserving that cone shape. 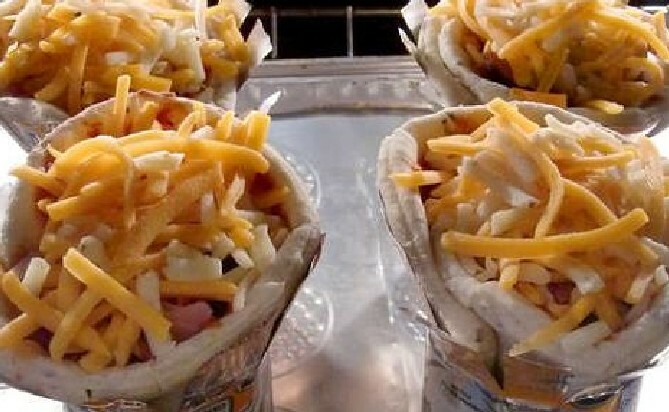 Now, an amateur cook has thought of using used cans from pop or beer to make pizza cones. It was Instructables user Mikeasaurus. You can make these with crusts you buy from the store or straight from scratch. Just mold the cone and put it in the can. then fill it with all your pizza … not “toppings”… insides. Cheese can also be used to partially seal things. So how does the can work? You cut one end off the can, then cut vertically part way down the can, so you end up with the bottom half of the can intact as it was, but the top half is a bunch of ribbon-shaped rays all bend on angles to accommodate the cone that will be set inside. Then cut your crusts in half or cut your dough into a semi (half) circle, wrap it around, put it in the can, and fill that cone up. Bake until you’re satisfied with the cooking, just like with other pizzas. A rough estimate is around 7 to 10 minutes at 175 (350) degrees. Next Article This Pizza. 2 Hours. 8 Friends. $1000. Do you accept?